Taking every conceivable precaution may sometimes lead you to make no decision at all. However, taking precautions is necessary, especially before hiring a demolition contractor. Precaution should not be used for over-thinking and indecision. It’s simply the first step in hiring a demolition contractor to help minimize potential risks and achieve the best possible outcome. Demolition is not a do it yourself project – You Tube and the Internet is filled with videos and tips for how you can save money by taking care of certain tasks without having to hire a professional. Demolition is not typically one of them. If you don’t really know what you’re doing, it’s best to hire a demolition contractor. They have the right equipment to get the job done in less time. By doing it yourself, you will likely end up paying more in the long run because you will have to bring someone in to fix any mistakes or misjudgments. There is more involved than just breaking or blowing things apart – TV home improvement shows make demolition look like fun. Wrecking something you are unhappy with in the first place can be liberating. But that’s not all you need to be concerned with. You also must think about the effect on surrounding walls and structures as well as what you will do with all that debris. A quality demolition contractor will have the experience and knowledge to handle all aspects of the project, both anticipated and the unexpected. Demolition is dangerous – you could be injured or killed from falling debris. The existing structure could be unstable, which may lead to damage to your property. Then there is the possible issue of power, gas and water lines. Failure to take all these matters into consideration might create a dangerous situation or even death for you and everyone else around you. Play it safe by hiring a demolition contractor. If you are building a home, re-building a home or removing a structure from your commercial property, you will need demolition. Any major undertaking such as this is a big deal and should not be taken lightly. Therefore, you need to find a demolition contractor that understands the job, is trustworthy and will do the job right. No two projects are the same so it’s vital to compare apples and oranges separately to ensure you get the right company for you. This takes preparation, planning and precaution. Get references and actually contact them. Every business lists reviews from satisfied customers on their website, but do you ever actually speak to these people? If you are like most of us, the answer is probably no. Nevertheless, this is crucial in finding the right demolition contractor for your project. Have there been any complaints about their work? How did the demolition contractor handle those complaints? Do they have the proper certifications and licenses? What permits will you need and is the company going to handle this for you or do they expect you to take care of it? You should also check with OSHA for resources to find out if the company has a good track record for compliance and worker safety. This is essential whether you are hiring a demolition contractor for residential or commercial endeavors. Decide how you will function while demolition is taking place. For example, if you are having your kitchen demolished to make way for renovations, how will you cook and eat until the job is done. How will you operate your business in the midst of noise, dust or blocked access to your building? Even if you are only having one small area demolished, the entire home or building might be unsafe and dangerous for you to stay there while the work is being completed. For your business, you might have to move certain functions to another location, such as your call center or conference rooms. You must determine what your backup plan will be so that you experience as few interruptions as possible. It’s important to develop a realistic budget for your project. Also, remember that sometimes things don’t go as planned and it could end up taking longer than estimated. As a result, you should add a little extra to your budget to compensate for unforeseen issues that could arise. For instance, removing a bathtub could reveal a leak that you were not aware of but that needs to be dealt with sooner rather than later. You should check around and get a few estimates. Then, even if you don’t select the highest bidder, budget for a cost that is a bit higher than the quote. It’s important that you and your contractor are on the same page. This cannot be done without frequent communication. Make sure you describe what you want in detail and that the contracting company is able to fully grasp your vision. More importantly, you must also comprehend their instructions and advice. If there is anything you don’t understand, ask questions. That way, everyone is on the same page and there are no surprises. Check that the demolition contractor is licensed. One of the worst things you can do is hire a contractor who is not licensed. You are doing a disservice to your project and your property. Without the proper licenses, there is nothing stopping them from doing shoddy work or scamming you out of your money. Those that are legitimate will proudly display their license number on their website, social media pages and in official documents. If you don’t see it anywhere, this is a telltale sign that something may be amiss and you should run. When it comes to licenses, each state has different requirements. You can find information online that tell you the requirements in your state. It’s also imperative that your contractor is bonded and insured. In addition, permits should be displayed onsite throughout the duration of the work. A written contract puts everything you’ve discussed in black and white to eliminate the chance for shockers or unexpected disclosures after the job has begun. Your contract should spell out the scope of the project, a payment schedule, what equipment will be necessary and an estimation of the timeframe for completion. It should be as specific as possible and clearly state how any changes will be handled. This is legally binding for both of you so make sure you comprehend all details before signing on the dotted line. The last thing you want is to give up your money or get halfway through a job only to realize you have been scammed. At that point, you will ask yourself if there were any signs you missed and how could this have happened. When you are armed with the right knowledge, you can protect yourself. Beware of a demolition contractor that asks for payment in full before starting your project. They may tell you that they need the money to purchase materials but this is a warning sign. A top quality contractor with experience in the industry should already have what they need. Also, try to avoid paying in cash. If it looks too good to be true, it probably is. You may feel lucky if you find a contractor that quotes a price far below other estimates or tells you the job can be completed in no time. However, that joy will be short-lived when you discover they cannot possibly live up to their promises. This is often the sign of an unqualified contractor who doesn’t really know what it takes to get your job done. And they are counting on you not knowing either. A closer look may reveal a long line of disgruntled customers. You must look beyond price to find a contractor that is trustworthy, skilled and offers you a fair price. A contractor that lacks insurance is big trouble. If there is an accident or other calamity, you will be liable. Trust the demolition contractor you choose. Don’t go through all this work only to constantly question every decision made by the contracting company. Keeping an eye on your project is understandable, second-guessing is not. If you have done your homework and selected the company with the most experience and skill, your project will be fine. Trust that they can handle any issues that come up and will communicate effectively at each step along the way. Demolition projects take time, expertise and competence. Don’t trust your job to just anyone. 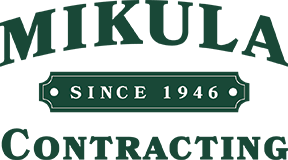 Mikula Contracting can handle all your demolition and disposal needs. From garage demolition to asphalt removal, we’ve got you covered. We service Essex, Passaic, Hudson, Bergen, Union and Morris counties. Don’t live with that unwanted structure, room or ground material a minute longer than you have to. Call today for a fast quote.